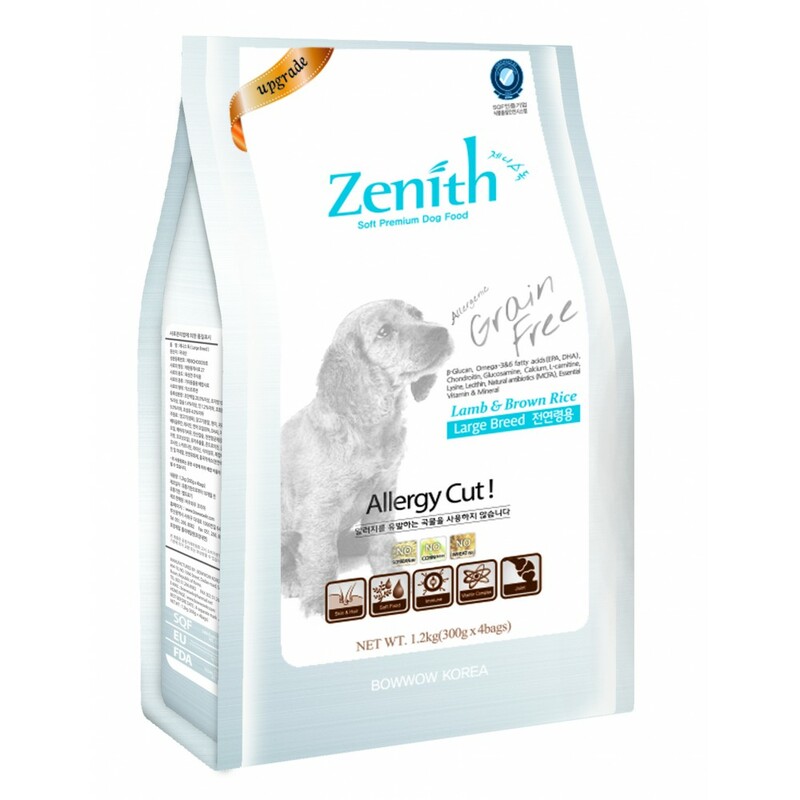 Bow Wow Zenith produces a range of grain-free kibbles for dogs of different sizes and life stages. This kibble is grain-free and is most suitable for large dogs with sensitive stomachs or mild allergies to grains and wheat. It uses lamb meat, chicken meal, brown rice and oats as the first few ingredients. This recipe also contains yucca extract which helps to reduce unpleasant odours in feces and alleviate pain and inflammation. Bow Wow takes into consideration the momentum of large dogs and custom designed this recipe to enhance joint health. This kibble can also help your dog to maintain a healthy skin, shiny coat and prevent obesity. A wholesome and nutritious meal — Rich in B-glucan, Omega 3 & 6 fatty Acids (DHA, EPA), calcium, L-carnitine, vitamins and minerals (vit. A, D3, E, B3, B1, B5, magnesium, iron zinc, selenium). Product size - 1.2kg (300g x 4 inner zip bags). Ingredients: lamb meat (fresh), chicken meal, brown rice, oats, B-glucan (B-1,3-1,6 glucan), vegetable lactobacillus, lecithin, salmon oil, (EPA, DHA), chicken oil, calcium carbonate, sunflower seed oil, natural antibiotcs (medium chain fatty acid, coconut oil), yucca extract, L-carnitine, lysine, dietary fiber (levan), complex vitamins and minerals (vit. A, D3, E, B3, B1, B5, magnesium, iron, copper, manganese, zinc, lodine, selenium), natural emulsifier, monascus color.